I have been playing Pay Day 2 for a while but forgot to put up the profile for it because it has been a busy year. I recently worked to get the Steam cards to get the badge for the game which reminded me I needed to put the profile up. I really like this game compared to the original. The addition of crime net and the DLCs keeps making the game interesting. 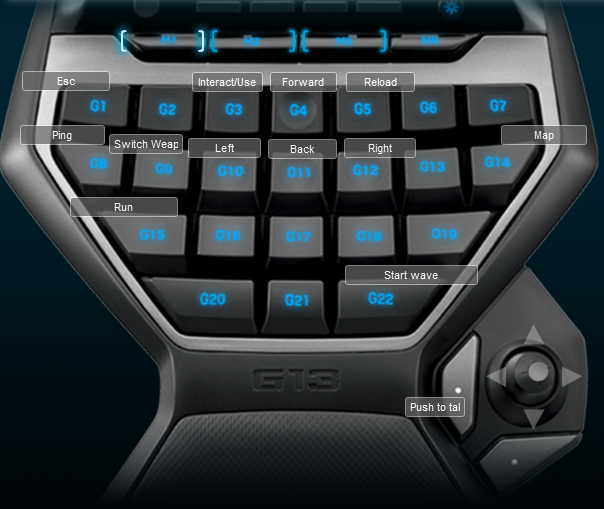 I created a Logitech G13 profile because there wasn’t a default one. The keyboard is pretty barren because there aren’t a lot of keys in this game, which is a good thing. The mouse is my typical FPS layout with melee and jump on my extra 2 mouse buttons. Below is the image of the keyboard layout so you can see how I have set it up before you download the profile.